I’ve made a long overdue update to my sidebar lists. Nissa and I have a baltic porter (named after the great jazz song) that will be ready to drink in a week…just in time for Nissa’s birthday. Sure, a strong, dark beer isn’t what you think of as the warm summer months roll in, but it’s a style I’ve wanted to brew for a while and a name I had to use. To get away from the dark malt beers, we are preparing to brew two seasonally appropriate beers in the next week. First up is a simple blonde ale. Second is a standard summertime saison that we will use a yeast we’re culturing from a bottle of De Blaugies/Hill Farmstead Le Vermontoise. I’ve also updated my list of upcoming races. At the end of the month, I’m running the second Craft Brew Races 5k to be held in Portland. I won a bib in the lottery for the 40th Marine Corps Marathon in Washington DC in October. As a training run for that race, I’ll head to Hampton, NH to take part in the Smuttynose Rockfest half marathon. Lastly, I am also running the Thunder Road marathon in Charlotte, NC in Novemeber. The last three races I’ve listed I will be running with my mom. She is also running the Mainly Marathons race in Sanford on August 24*. After finishing Thunder Road, she will have qualified for the Marathon Maniacs! Way to go Mom! *Mainly Marathons is running a promotion right now where you can enter one of their races for free if you’ve never participated in one of their events! Check it out on their homepage. Inspired by this series of posts on If My Coaster Could Talk, I did some ruminating on what brewery collaborations I’d like to see Maine’s breweries involved in. Some of these ideas have been in my head for a while now, others took some thought. The ideas others came up with were quite impressive—many of which I would enjoy seeing come to fruition—but I don’t think you can talk too much about beer, so I’m presenting my responses to these questions as well. The greater Portland area has so many new breweries that it is easy to get overwhelmed by the selection and forgo all of the great beer that is being brewed elsewhere in the state that doesn’t get trucked down here on a regular basis. A dream collaboration would allow for some of these less hyped breweries to showcase their talents to all of us in Cumberland and York counties by teaming up with brewers that have name recognition or established distribution channels. Therefore, I propose a Penobscot Bay three-way: Marshall Wharf, Andrew’s Brewing and Rock Harbor Pub and Brewery. All three are located on the beautiful stretch of coastal Route 1 between Rockland and Belfast, which gives them regional unity. Each brewery has their own pub (Andrew’s just opened) where their small batch beers are served almost exclusively, which shows they have an experimental side to exploit in their collaborative brew. Lastly, each brewery has one of the qualities I mentioned above; Marshall Wharf has beer geek credibility, Rock Harbor has little to no distribution or name recognition in southern Maine, and Andrew’s can get its bottles and kegs across the Portland area. I’m sure these three could make something special that would end up in bottle shops and beer bars throughout Maine. It may very well be that no dreamt up collaboration can top one that has actually happened. Isabelle Proximus, the five-way collaboration between Allagash, Lost Abbey, Russian River, Dogfish Head and Avery, is one of the greatest beers ever made in America; a beer of such renown, legend and rarity, it is a true example of a white whale. But if I have to come up with an answer to this question, let’s not shoot for the moon, but think of something a little more accessible. My favorite kind of beer is a hoppy red ale, so I’d like to see Maine Beer Co., makers of Zoe; Lagunitas, makers of Lucky 13; and Tröegs, makers of Hopback Amber to collaborate on an exceptional example of the style. Those three beers are some of my favorites. A combination of them would be heavenly. Brew it in Hershey, PA to use Tröegs’ hopback, but be sure to distribute it here in Maine. Do What’s Right, make this beer for me. A collaboration across the seas needs to be very innovative in order to justify all the expenses, and when I think of an innovative Maine brewery, I immediately think of Oxbow. Most of what they produce can be lumped under the classification of farmhouse ale, but no two of their beers are alike. They use a wide range of interesting ingredients (local spelt, interesting hop profiles, grain from artisanal malt houses) and have a history of collaborations yielding excellent beers. They also make a beer that I believe is unique to Maine: Sausuga, a rice ale with Brett. Imagine what would happen if Tim and Geoff took their Sausuga recipe to Japan and brewed it at the Kuichi Brewery, home of the Hitachino Nest line of beers? Their experience aging beer in distilled sake barrels could only improve one of the best ales to come out of Newcastle. I’m sure whatever these two innovators brewed up would be epic. If time, space and money were disregarded, I would love to see a collaboration between the Lively Brewing Company and Brouwerij Mort Subite. Lively Brewing is the beer making side of the Ebenezer’s family of beer bars. Chris Lively and Michael Lacharite are making some excellent beers in Brunswick. Brouwerij Mort Subite is a very small Belgian brewery specializing in wild ales. They are owned by a company that is itself owned by Heineken, but don’t let that deter you. I said time and space are no object in this scenario, so I want this collaboration to be with the mid-80’s incarnation of the brewery, when they were producing the Eylenbosch line of wild ales. Chris Lively has a rather large stash of Eylenbosch Gueuze bottles, all made and cellared since 1984. It is an exceptional beer. A combination of the flavors Mort Subite was able to concoct at that time, along with Chris and Michael’s interest in wild ales could only lead to a beer that would blow the socks off any unsuspecting drinker walking into Ebenezer’s. And of course, the beer would have to be released as part of an epic, multiple course, multiple hour Belgian Beer dinner, prepared and presented as only Chris Lively can do. A lot of information online about Brouwerij Mort Subite is only available in French and Dutch, but here’s one site in English. There are a few collaborations I’ve dreamt about that didn’t quite make the cut in my responses as they aren’t entirely fleshed out ideas, more like sketches, but I wanted to write them out nonetheless. A collaboration between Alan Pugsley and any one of the smaller Portland based breweries to make an ‘only the location of the brewery makes it inauthentic’ authentic English mild. Ringwood would be the yeast, but it wouldn’t be a rushed fermentation, and the beer would only be served via traditional cask, following strict CAMRA standards. A series of brews made with Mike at the Great Lost Bear (who has brewed at Sierra Nevada) and the various Portland area breweries to be served exclusively at the Great Lost Bear, perhaps for a special occasion; Portland Beer Week comes to mind, or perhaps the Bear’s 35th anniversary, which takes place this year. Freeport Brewing needs to team up with someone to make an imperial, barrel-aged version of their chocolate porter. I’d like the breweries of Maine to collaborate more with our state’s large population of homebrewers. Perhaps a series of brews and recipe kits made in collaboration with Maine Brewing Supply? I know it’s not a collaboration, but I really, really want to see In’finiti brew a DIPA using only Galaxy hops. It would be named To In’finiti and Beyond, because Toy Story and Buzz Lightyear are awesome and ripe for exploitation via beer name. I’ve already brewed my own Galaxy IPA and named is Space Ranger IPA, but only In’finiti can give Buzz’s catch phrase the beery justice it deserves. This initial experience showed me that this place is just as inviting and friendly as Ebenezer’s is. Every patron is a friend and is always welcome. Within ten minutes of sitting down I was introduced to Chris Lively (the owner) as a Beer Advocate, and he handed me a $600 bottle of 3 Fonteinen J & J Oude Gueuze that he was planning on uncorking for the official opening of the bar on July 3. You don’t get an experience like that at just any bar. The Lion’s Pride is laid out in three sections. As you walk in the front door you enter the dining room. It’s full of comfortable looking tables. To your left is a former sun room that provides the closest thing to outdoor seating you’ll find here with its glass walls. To your right is the bar area, where I spent all of my time and which I will cover in my review. As I mentioned, there is an L-shaped copper topped bar. Behind one side of it are the 35 taps, each topped with a custom made blown glass tap handle. There are no brewery labels on the taps, all you have to go by is the wall-length chalkboard listing all 35 draft selections. Continuing the no labels theme is the glassware section behind the other side of the bar. Here you’ll find wine, pilsner, tulip and snifter glasses, all unadorned with any markings [No pint glasses! This is a bar with no pint glasses!]. Later on in the evening, they put up a selection of Allagash glasses; it was the only labeled barware in sight, save one random St. Bernadus chalice that looked out of place on it’s shelf. I doubt that the Allagash glasses will last much longer than the kegs of Fedelta and White that are currently on offer, unless another Allagash keg is tapped. Surrounding the glassware are the bottle coolers, although you could easily call them a beer museum. In my quick perusal I spied a bottle of Gargamel, numerous vintages of Cantillons, a selection of De Rankes, and some 3 Fonteinens (including the aforementioned 03 J & J Oude Gueuze), and that was jsut the labmic cooler. At the other end of the bar are a number of Trappist selections, abbey ales and other Belgian goodies. Elsewhere in the barroom you’ll find a flat screen television, a long upholstered bench on one wall, a number of tables with upholstered chairs that match the bench, and satellite blues music on the loudspeakers. On the walls are an assortment of bar signs (including a few St. Sixtus ones that were quite impressive). Even better than the bar signs are the large murals representing a number of different beer labels form around the country. [Be sure to look up at the ceiling as you enter the restaurant for an impressive but easily missed mural] The walls are either dark red, yellow or black, representing the three colors on the Belgian flag. There is a tin ceiling. I don’t recall what the lighting was like, but it was bright enough to feel comfortable. There are a few windows that look onto Pleasant street. It was very cozy and comfortable without feeling forced. The service was excellent, with everyone eager and willing to discuss beer. They were also quick to ask you if you wanted a refill once your glass got empty (for both beer and water). I forget all the names of the people I met, but each of them would be a perfect server; to have a team this prepared and competent on opening day is amazing. I didn’t try the food, but it looked great. The beef and pork come from the same farm that provides the meat for Ebenezer’s Pub, and those selections are to die for. All of the fruit and vegetables are purchased fresh at the local farmer’s market. I imagine the seafood is local as well. The cheeses are all artisanal, including some Trappist selections. One aspect of the bar I cannot review yet is the brewery side. All of the brewing equipment is visible through large windows in the dining room. It will be a few months before anything drinkable is produced, but if it is even half the quality of the rest of this bar, then the beers will be something to go far out of your way for. In summary, I can’t say enough good things about the Lion’s Pride. Previously, any beer fan would need to go to any of three places in Maine: Ebenezer’s, Novare Res or the Great Lost Bear. We can now safely add a fourth location to that list, and it may very well enter the list at number 1. If God were a craft beer drinker, he’s be a regular here. Do whatever you can to get to the Lion’s Pride. You will not be disappointed. For me, it is brewpub perfection. Here’s an image of our second batch, the California common. When I got home from work today, there was foam bubbling up through the fermentation lock, so I hooked up a hose to pipe the excess foam off into a bucket. We should be able to reattach the lock tonight or tomorrow morning. Our first batch of beer, the Beer Drinks You Red, has been bottled! Our carboy filled 1 growler, 4 22oz bombers and 33 12oz bottles; quite a haul! We’ve already begun brewing our second batch, an as-yet-unnamed California common (aka steam beer). Like the red, this brew will ferment for one week, then condition for four weeks in the bottle. Today Nissa and I began the Lincoln Street Brewing Company when made our first batch of beer. After buying some used brewing equipment this past week, we went to Maine Brewing Supply today to purchase a homebrew kit. We decided on a red ale, and have named it Beer Drinks You Red Ale. 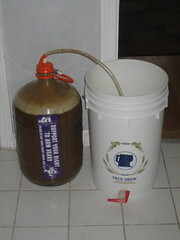 After mixing and boiling the ingredients, they are now in the fermenter, a 5 gallon glass carboy. The beer will remain here for a week to ferment. We will then bottle it. 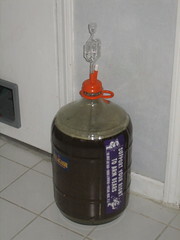 It spends four weeks carbonating in the bottle. We’ll be able to drink our first creation the first weekend of May. We’re already planning on returning to the supply shop to pick up ingredients for batch #2, a pale ale, which we’ll start fermenting as soon as the red has been bottled.